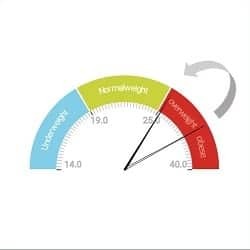 Today I reached “normal body weight” according to Body Mass Index (BMI) classification — no longer obese and not even overweight. Normal. It seems surreal. When I began my health and weight loss journey on March 5, 2017 (19 1/2 months ago) I was obese. My weight bordered between Class I and Class II Obesity and I had multiple metabolic health issues. I was diagnosed with Type 2 Diabetes 10 years earlier, had elevated blood pressure and abnormal lipids (cholesterol). Most significantly, I was in denial as to just how ill I really was. The undergraduate and post graduate degrees on my wall did not inform reality. The mirror did. I didn’t feel well that day and took my blood pressure. It was dangerously high— classified as a hypertensive emergency. I decided to take my blood sugar too and it was way too high. I sat and considered the numbers of both and considered my options. 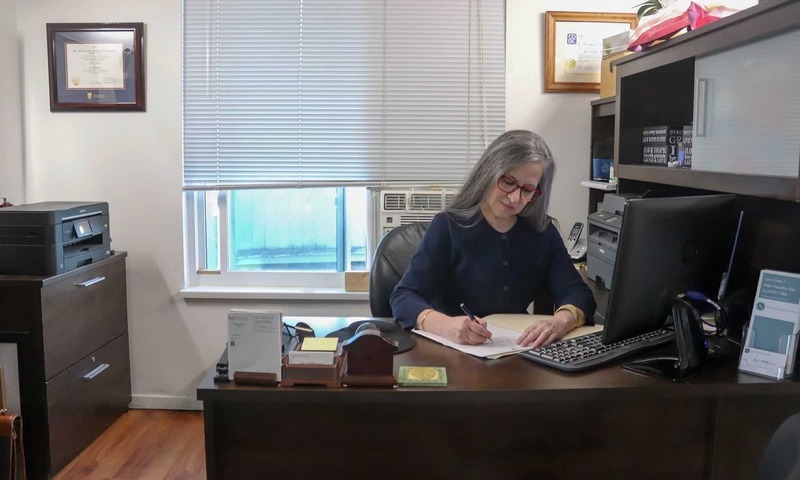 At the time, I only saw two choices; I could go see my doctor who would have immediately put me on multiple medications or I could change my lifestyle. In hindsight the safest option would have been to do both, but I chose instead to begin to “practice what I teach”. You see, I had two girlfriends suddenly die of natural causes within 3 months of each other just previous to that day; one of them I had known since high school and the other since university. They were both my age, both chose careers in healthcare, just like I did, and both died from preventable causes. They spent their lives helping others get well, yet unable to accomplish the same for themselves. It was not for lack of trying, but for not having found a solution before death ended both of their lives. March 5, 2017, I realized that if I didn’t change I would likely die of heart attack or stroke, too. Their deaths may have saved my life. I began a low carbohydrate diet immediately. I cut refined foods, ate whole unprocessed foods, didn’t avoid the fat that came with whole foods but didn’t add tons of fat either. 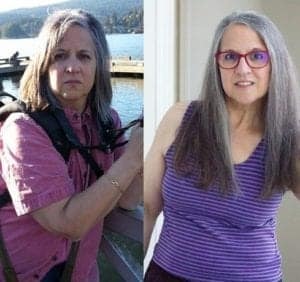 While it helped a great deal, after several months I realized that I needed to lower my carbohydrates further in order to achieve the remission from Type 2 Diabetes that I sought. I didn’t simply want to lose weight — I wanted to get healthy! I consulted the experts and continued to make dietary modifications that got me closer to my goal. The first significant improvement was in blood pressure followed by blood sugar. I lost weight and more significantly lost inches off my waist. While I hadn’t been formerly diagnosed with non-alcoholic fatty liver disease based on my lab work I more than likely had it. I tweaked and adjusted my Meal Plan many times over the last 19 1/2 months — each time moving myself closer and closer to my goal. Ten days ago I was within an inch of my waist circumference being half my height and now I am within 3/4 of an inch of it. It’s happening! Two days ago, I got on the scale and saw a series of digits that I had not seen since my twins were born 26 years ago tomorrow. I decided to crank some numbers. I was almost there. The photo on the left shows the weight category form two days ago. Today it was in the normal range! I am not one of those people that the press frequently writes about that pursued a low carbohydrate or ketogenic diet for “quick weight loss”. I wanted to get well. I chose a low carbohydrate diet for therapeutic reasons because it was my underlying high insulin levels which drove my high blood glucose and high blood pressure. To get well, I needed to address the cause, not the symptoms. 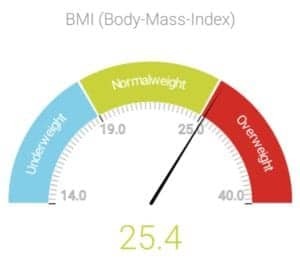 So here I am, having reached normal body weight! Did I think at the beginning that I would actually get to this point? I wasn’t sure. I knew it was possible because I had helped others achieve it, but had never tried myself, so I didn’t know. For health reasons, I no longer had the option of doing nothing! At first, I set my preliminary goal as “no longer being obese“. Then I revised it to “being less overweight“. I found some old photos recently of what I looked like as a young adult and realized what the weight was where I felt and looked my best then reset my goal weight once again. I knew it was entirely doable! Losing weight has been challenging, but not difficult. Sure, I needed to determine what was holding things up at various stages of my journey and make dietary adjustments just as I do for my clients, but it’s much easier to do that for someone else than for oneself. The “hard work” will be finding out how to eat where I don’t lose any more weight, while maintaining my blood sugar and blood pressure at the best possible level. If possible, I want to achieve full remission from Type 2 Diabetes and if not, I will learn how to maintain full reversal of symptoms. I’ve documented the entire process throughout “A Dietitian’s Journey”, including “fat pictures” and lab test results to demonstrate the therapeutic benefit of a low carbohydrate diet and that this lifestyle is both practical and sustainable. Perhaps you would like to find out how I can help you achieve your own health and nutrition goals? Please send me a note using the form on the Contact Me tab above and I’ll be happy to reply.